The Cost for Kitchen Updates - Armchair Builder :: Blog :: Build, renovate, & repair your own home. Save money as an owner builder.- Armchair Builder :: Blog :: Build, renovate, & repair your own home. Save money as an owner builder. What is the typical cost for kitchen updates? If it’s time to remodel your kitchen and you want to know what the costs would be, you have come to the right place. In this article we will discuss the cost range for each option for your remodel. For the purpose of comparison and to make sure our cost numbers make sense, let’s assume the kitchen updates are for 20 lineal feet of cabinets. Cabinets: Cabinets will most likely be the biggest cost for your new kitchen updates. I have built killer kitchens with cabinets that cost as little as $1600 for a flat panel oak cabinet with an economical, particle board box. These production cabinets were obviously on the low end of the price spectrum but they were made well. I have also spent as much as $25k on a custom cherry kitchen with all kinds of fancy storage solutions and custom details. For your kitchen updates you will want to create a realistic budget and determine the cabinet that fit within this range while fulfilling your design requirements. If you have trouble getting the quality you want for your budget, you may want to look into cabinet refacing. Refacing saves money on labor because there is no removal and re-installation (typical cost savings is 30-50% for refacing over new cabinets). And if you still fail to meet your kitchen updates budget, paint the cabinets and apply new hardware for a totally new look (less than $100). Countertops: At the moment, granite countertops are still king for kitchen updates. They are heat and scratch resistant (although they still can scratch) and have a great custom look. I have purchased standard granite colors for as little as $29 per square foot (including installation and material…you remove the old countertops though). For a higher end granite, you can spend up to $100 or more per square foot. Carefully select the edge style for the countertop in your kitchen updates. The more complicated edges will cost you a few hundred bucks more, but can really add a nice custom look. If you want something more durable than granite for your kitchen updates, you will want to take a look at the solid surface countertops like Caesarstone. These quartz countertops are nonporous, stain, scratch, and heat resistant. Prices are typically comparable to granite. Laminate countertops can give your new kitchen updates a long lasting, quality look. These are your most affordable option and can be installed for as little as $700 for labor and materials. By picking the right color for your kitchen updates, laminate countertops can really give your new space an affordable pop. Backsplash: Some people like the look of granite on both the countertop and the full wall up to the cabinets (as a backsplash). This combination can make for a very impressive look with the right colors. The only problem is it can be too much (too busy) depending on the granite you choose. The price for the granite backsplash is typically the same price per square foot as the countertop granite. If you want to cut the price down considerably, you can go with a 4″ backsplash of granite. The 4″ granite backsplash will save you about 75% over the full granite backsplash in your kitchen updates. For our latest kitchen updates, the Italian granite was a little too busy to pull off the full granite backsplash. So, we used a glass subway tile. Typically, installation costs run in the lower $20’s per square foot. The backsplash tile material for your new kitchen updates range from $10 to $50 per square foot, depending on the quality you choose. 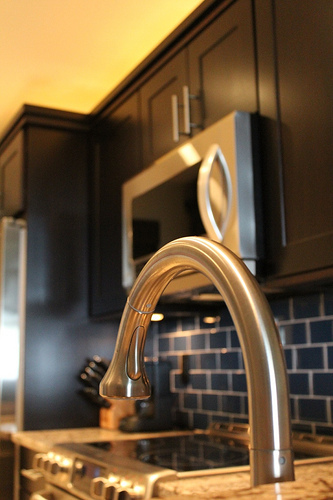 Flooring and appliances are the other major costs for your new kitchen updates…we will discuss these in a later post. Let us know if there are any other topics we could cover to help with your kitchen updates. << What is Drain Tile?